The first appearance of the tri-cobalt device was in the original series episode "A Taste of Armageddon". In the episode the planets Eminiar and Vendikar are fighting a centuries long war. In order to preserve their societies from the full destruction of the conflict, they conduct their attacks on one another entirely by computer; when the simulations suggest a hit the computers calculate the casualties and citizens are ordered to report to suicide booths for orderly disposal. A previous Federation ship which visited the planet fifty years earlier, the Valiant, was logged as a casualty in this manner and the Eminians destroyed the ship accordingly. 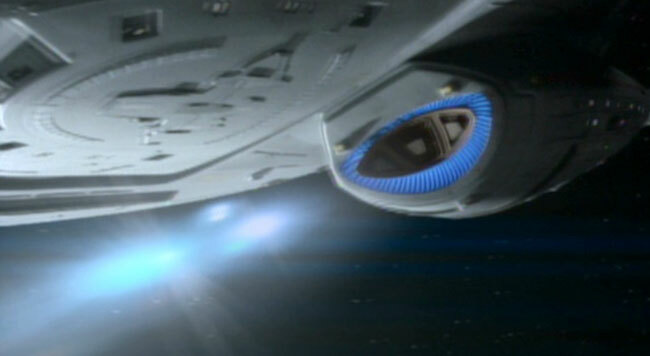 During the Enterprise's visit, the Starship is also registered as having been destroyed by a tri-cobalt device. We receive no information regarding the technology used in the weapon and no real assessment of how powerful they are. On the one hand, the Enterprise was apparently logged as being destroyed by a single hit. But the ship had no shields up at the time since the crew were unaware of the computerised battle going on; without shields even a simple nuclear weapon is capable of inflicting at least significant damage to the Enterprise, as seen in "Balance of Terror". Plus, the Eminians and Vendikans are using transporters to deliver their weapons, so for all we know they could have beamed the weapon directly into the bridge or the engineering spaces, bypassing any possible protection from the hull and structural integrity fields completely. Also, bear in mind that this is a computer war with a simulated destruction of the ship, not an actual destruction. The Eminians would have no way to know the defensive capabilities of the Enterprise, no real basis on which to claim that a Vendikan weapon could have destroyed the ship. Most likely the computers would either assume that the Enterprise was the equal to Eminian ships, or assume that it was on a par with the Valiant of fifty years ago. In general, Eminian - and by extension, Vendikan - weapons technology seems slightly inferior to the Enterprise. The Eminians use disruptors both as sidearms and for planetary defence. Despite apparently being sound based, these weapons could be fired at spacecraft in orbit. However, the Enterprise was able to withstand sustained fire from the planetary disruptors. When Kirk ordered the ship to destroy the Eminian civilisation, Scotty took the Enterprise out of range of the planetary weapons and prepared to fire on the surface, indicating that the ship's own phaser banks comfortably out-ranged the Eminian weapons. Given this, I tended to think of the tri-cobalt device as a fairly primitive weapon. indeed, my first guess was that it was a type of nuclear weapon. This is probably what the Original Series writers had in mind, thinking of "tri-cobalt" as an improvement on the real world "cobalt bomb" talked of at the time, much as "di-lithium" was meant to be a super-tech replacement for the real world lithium. You can see that each weapon has some sort of internal structure to it; three distinct glowing areas. We can only speculate as to what that could mean, but it could well be that the "tri-" part of tri-cobalt refers to the three-lobed structure of the weapon. Note also the colour of the tri-cobalt devices, white like a quantum torpedo. This threw up the first big question; if the tri-cobalt warhead was indeed more primitive than photon torpedoes, then why was Voyager carrying them? The implication of "Caretaker" seemed to be that this was a new and advanced replacement for the photon torpedo. But if they were indeed a new and advanced weapons, why did Voyager mostly use photons over the following years rather than tri-cobalts? We could say that the new tri-cobalt devices were just coming into service, and were only available in limited numbers - so Voyager only got two of the new weapons, with photon torpedoes filling out the weapon stocks. But this grows unsupportable when we look at the Dominion war. Surely Starfleet would be issuing these new and improved weapons to the fleet as fast as possible during the war; yet for the rest of Deep Space Nine, no Starfleet ship ever used tri-cobalt devices. One common view expressed by fans was that tri-cobalts were indeed primitive weapons, but that some were carried by Starfleet ships as something like 'demolition munitions'. It may be that they are good for destroying large physical structures, but not very effective when it came to combat operations. We know that shielding is better at stopping some types of energy than it is others - Federation shielding was initially highly susceptible to the Dominion's phased polaron beams for instance. Perhaps tri-cobalt devices have a high yield like a nuclear weapon, but are extremely limited in their effect on shields and so next to useless in combat. Seven : "Specify the yield of the tri-cobalt device." Seven : "The Captain ordered Commander Tuvok to destroy the array. He fired two tri-cobalt devices. Are those weapons normally carried on Federation Starships?" "Yet they were part of Voyager's arsenal. Why?" "I can. Neither phasers nor torpedoes are capable of creating a tear in subspace. A tri-cobalt device is." So the tri-cobalt device is a subspace weapon of some sort! I don't think we can realistically say that a subspace weapon is a primitive demolition charge; this heavily implies that the tri-cobalt device is in fact an advanced weapon, more advanced than the Federation photon torpedo. "Unknown. But our shields are down to 82%"
"I don't know what's causing it - there's nothing on sensors." "Janeway to Seven of Nine." "Are you picking anything up in astrometrics?" "The inhabitants appear to have developed antimatter torpedo technology. I believe we're under attack." "The torpedoes are being fired at three-day intervals. They're making refinements each time, increasing the detonation yield." "What was that last one?" "What will they think of next?" The dialogue leaves little doubt; the natives are steadily improving their weapons over time, and they go from using matter/antimatter weapons to tri-cobalt devices. It's pretty much certain that the tri-cobalt must be a more advanced weapon than the photon torpedo. "The Son'a have been suspected of producing mass quantities of the narcotic ketracel-white... their ships are rumored to be equipped with isolytic subspace weapons outlawed by the Second Khitomer Accord." "Why would we be involved with these people?" "Sir, they've detonated an isolytic burst... a subspace tear is forming!" "I thought subspace weapons were banned by the Khitomer Accord?" "Remind me to lodge a protest!" "Commander, our warp core is acting like a magnet to the tear." "We're pulling it like a zipper across space." "Will that stop the tear?" "Detonating the warp core might neutralize the cascade... but then again it might not. Subspace weapons are unpredictable. That's why they were banned!" We know for sure that Voyager carried tri-cobalt devices, we know for sure that tri-cobalt devices are subspace weapons, and we now know that subspace weapons are banned. So... how can we get out of this? Option 1 is to assume that using the weapons is banned, but carrying them is not - kinda how nations like the USA carried nuclear weapons on their ships but had a 'no first use' or other such policy. This would at least explain why Voyager had tri-cobalt devices on board; Janeway's actions in "Caretaker" would then be illegal, but Janeway was not the type of captain to let a little thing like that get in her way on one of her more insane days. Option 2 is to assume that only certain types of subspace weapons are banned. Riker does specify that the Son'a carry "isolytic subspace weapons", which may be a different thing entirely from tri-cobalts just as dynamite and C-5 plastic explosive are different. Against this, both Perim and Geordi do make blanket "subspace weapons are banned" comments, but maybe they were just shortening for brevity in the heat of the battle. But I prefer Option 3. We are told that Gowron has renounced the Khitomer accords in "The Way of the Warrior", which takes place in 2372. He signs back up to the same accords in "By Inferno's Light", set in 2373. As far as we know, these are the exact same accords - Gowron doesn't re-negotiate them at all, Sisko simply asks him to sign back up to the accords and Gowron does so on the spot. So either Gowron is signing the first Khitomer accords here, or the Way of the Warrior reference is talking about the Second accords and nobody bothered to mention the fact. Assuming that what Gowron signed is indeed the original Khitomer accords, then at some point after 2373 the Federation and Klingon Empire re-negotiated the accords, and it is these second set of accords which banned subspace weapons. Since "Star Trek : Insurrection" is set in 2375, this event could have happened anytime between 2373 and 2375. "Caretaker" is set in 2371, well before any of this. So the second Khitomer accords would not apply at all in that episode; Voyager would be free to carry subspace weapons and Janeway free to use them. This is a Dominion cruiser firing on Deep Space Nine in "Call to Arms". The torpedo glows white, and there is some kind of structure to it; it seems to be composed of three distinct parts. In fact, it is visually identical to the tri-cobalt devices used by Voyager in "Caretaker", pictured earlier. Coincidence? We could say that these are quantum torpedoes being fired in a three-round burst... but such bursts have always been seen to separate after firing, even when they are all targeted on the same ship - see "Yesterday's Enterprise" for example. It's not certain that the Dominion is using tri-cobalt devices here... but it's certainly the simplest explanation of what is seen on screen. This is another nail in the coffin of the "demolition explosive" idea. It is possible that the Dominion makes some odd choices in their weapons inventory, using torpedo types which are not really all that well suited to combat for whatever reason. But really, it seems highly unlikely to me. And the "demolition explosive" idea was only invented in the first place as a way to explain why Voyager was carrying primitive weapons in "Caretaker". It's very clear from the canon that in fact tri-cobalts are at least the equal to photon warheads, if not superior, so the "demolition explosive" concept is left as a theory with nothing to explain; there's no reason to hold onto it. We are left with the big question of why we don't see Starfleet using tri-cobalt devices more often after "Caretaker", or indeed at all. They are more advanced than photons, presumably more powerful. We might argue that they are really hard to build and so are only available in extremely limited numbers. But can they really be so limited that they have never been seen again? we might say that tri-cobalts are treated a bit like nuclear weapons today; very powerful, but restricted in their use for political reasons. Maybe the second Khitomer accords banned isolytic subspace weapons outright, and restricted the deployment of tri-cobalts heavily. Navy ships during the cold war era tended to carry mostly conventional weapons with a small number of nuclear ones, maybe Starships do the same. But if the Dominion are using tri-cobalts openly in an actual shooting war, then surely Starfleet would follow suit - just as the USA would no doubt start issuing large numbers of nukes to their ships if they were engaged in a war where the enemy was doing the same. Problems of production, training, etc might still apply to limit the numbers somewhat, but surely these would not be insurmountable. A much better possibility presents itself when we consider the quantum torpedo. This weapon was first seen in the episode "Defiant", when the stolen Defiant used them against Cardassian ships with considerable success. Previously the Defiant had been stated to carry photon torpedoes, on her first mission in "The Search". She would occasionally be mentioned as still carrying photons in the future - "Paradise Lost" shows her using photons for instance - but after "Defiant", the ship would almost always use her quantums. "Defiant" is set in 2371, on stardate 48467.3. 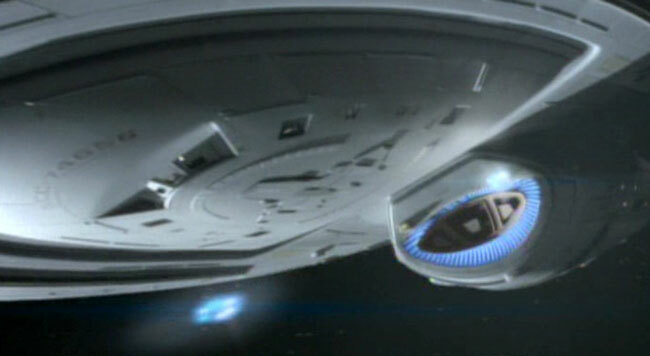 Voyager's "Caretaker" is set in the same year barely two months earlier, which puts it right before the quantum torpedoes made their debut and began to be used regularly. The obvious conclusion is that Starfleet was looking for a photon torpedo replacement and decided to evaluate two different technologies, quantum torpedoes and tri-cobalt devices. 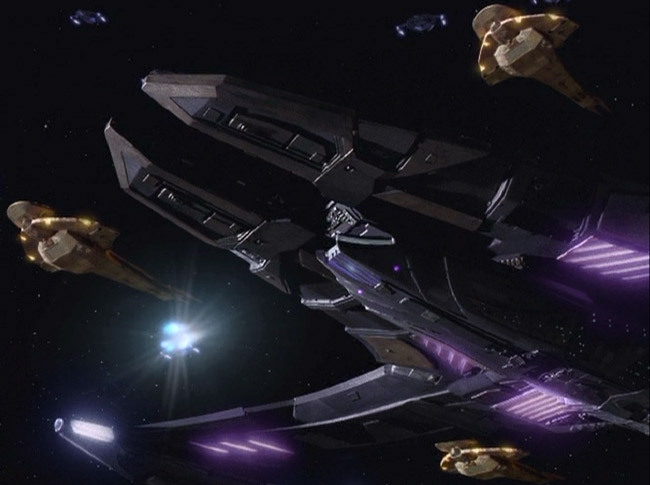 As part of the evaluation process, at least some ships were issued with small numbers of these weapons; Voyager got a couple of tri-cobalts, Defiant may well have been carrying a couple of quantums even back in "The Search". For whatever reason, some time after Voyager was lost on 48467.3 Starfleet decided to go with the quantum rather than the tri-cobalt. In fact, you could even suggest that the weapon Tom Riker used on the stolen Defiant were the evaluation weapons that the ship carried, and that it was their success against Cardassian ships under combat conditions which made Starfleet choose them! So, what do we know for certain, and what am I only guessing at? We can be reasonably sure that this ban came into force after "Caretaker", but not certain of this. The alternative is that Perim and Geordi are careless in their wording or that Starfleet and/or Janeway use illegal weapons, which you may or may not find believable. We can only speculate that Starfleet was evaluating tri-cobalts versus quantums and chose the latter, though it is a nice convenient and technobabble-free explanation of why Voyager had them when nobody else does.